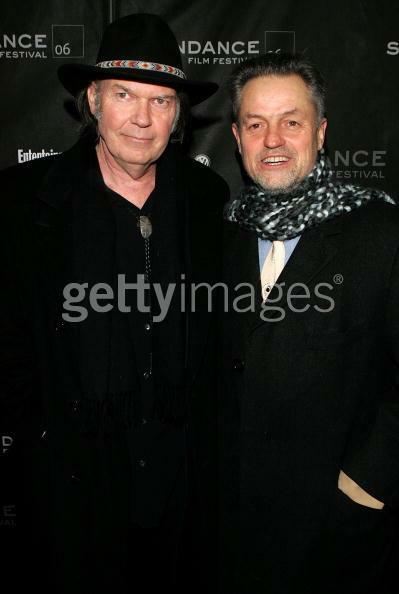 Last night, the concert film of Neil Young called Heart of Gold, premiered at the Sundance Film Festival. The film received a standing ovation at the conclusion and the consensus reaction thus far from early reports -- which are just beginning to flow in -- is that it is "a lasting, sensational film that makes you feel like you’re sitting in a concert." Actor Robert Redford, the Sundance Festival director, attended the premiere along with many other celebrities. The film is directed by Jonathan Demme and was shot in Nashville, TN last August. Demme introduced the film along with Neil Young, wife Pegi and son Ben who attended. 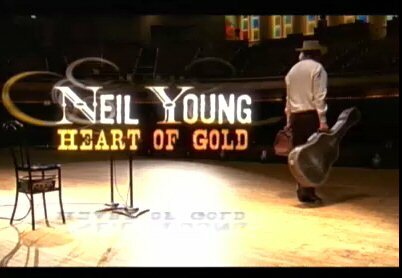 "Being at the world premiere of Neil Young: Heart of Gold was almost like attending one of the concerts in the movie. The audience clapped and cheered riotously after every song, paying homage to Young, who was in attendance with his family and members of his band." From Los Angeles Times: "Director Jonathan Demme says he visualized 'Heart of Gold,' which includes such Young classics as 'I Am a Child,' 'Old Man' and 'Harvest Moon,' as 'a dream, an ongoing dream of country music. 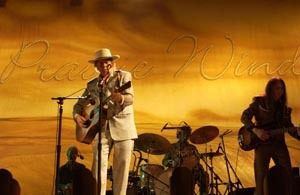 This concert is going on in Neil Young's head, it's his dream of his favorite places and songs.'" "This smart, aesthetically understated concert film from Jonathan Demme will transport Young's legions of baby boomer fans back to the future, as 1969 re-invents itself in 2005 for Young." "From there I went to the Eccles Theatre, home of the two-dollar dollar-fifty bagels, to get a ticket for the evening’s big event: “Neil Young: Heart of Gold,” a concert film directed by Jonathan Demme. Some members of the press were already in line for their tickets, some two hours before the screening. Civilians were queued up, too, eager to see the movie and Neil Young himself, since the old guy was scheduled to be in attendance. You should know that in the soundtrack of my childhood, Neil Young plays a significant part. I’ve never paid him much attention, but he’s my dad’s favorite performer, and so his records were played often when I was growing up. In fact, my dad knew about this film already and has indicated his eagerness to see it when it’s released in theaters next month (after having its world premiere at Sundance). So it was mainly for my dad that I wanted to see it tonight. There’s a press screening later in the week, but Neil Young won’t be there in person. I figured if Dad can’t be here tonight to be in the same auditorium as one of his idols, I can do it for him, as his proxy. The theater was packed. Some 140 seats were reserved for Young and his people. (Now THERE’S an entourage worthy of a rock star.) The volunteer ushers were strict about not letting people save seats unless their friends were actually already on the premises somewhere, and a woman in front of me became very agitated. I didn’t get all the details, but I did hear her shout, “I can’t sit in two seats at the same time!” I thought: Well, not with that attitude you can’t. Demme introduced his film by thanking about a hundred people by name, which was boring and a little pretentious. 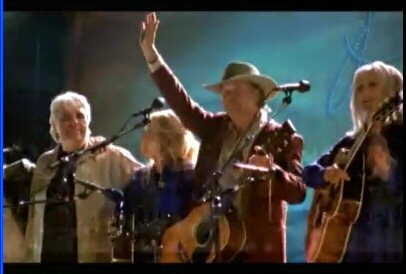 Then he brought Neil Young to the stage, to an enthusiastic standing ovation. Neil said a few simple “thank yous” and returned to his seat so we could all watch the movie. Turns out it’s a pretty fantastic film. Demme’s style is unobtrusive: He lets Young and his band do their thing, and he stays out of the way. There are no tricky camera angles or cool editing tricks. It’s mostly long, unbroken takes and plenty of close-ups. The movie lets Young’s songs speak for themselves. And what songs they are! How have I not paid attention to this before? Some of the songs are angry; some are sad; some are wistful; one is even about an old hound dog he used to have. But he sings all of them with conviction and heart. The lyrics are often poetic but rarely pretentious. The musical performances are world-class but not showy. He sings one that he calls an “empty-nester song,” about his daughter being away at college and living her own life. He tells her the door is always open for her to come home and visit: “Yes, I miss you, but I never want to hold you down / You might say I’m here for you.” It’s so simple and sweet, and through the whole film, but particularly that song, I couldn’t help but think about my dad. I thought about how even if everything keeps changing, and even if Burgie’s isn’t there anymore, and even if what cost $1.50 yesterday costs $2 today — well, Dad and Mom are still there, at home, constant and unchanging. Will the film make everyone want to call their dads afterward so they can talk about Neil Young? Probably not. I can only tell you how it affected me. After five exhausting Sundance days, it was nice to be reminded that movies can be more than just movies. They can be total experiences." The film is scheduled to open on February 10. More on the filming of "Prairie Wind", the film's namesake song "Heart of Gold" and other Neil Young movies. oh boy! Can't wait to see this up on the big screen. Just reading the review made me want to call my Dad. I am one of those "Dads". I have been a NY fan since the very early days of Buffalo Springfield. Through some of my daughters connections she, my son and I were able to attend the filming in Nashville last August. A once in a lifetime event! I am proud to say that my kids are both Neil fans as well. There is nobody like Neil Young. Ever prolific, hauntingly beautiful lyrics and melodys. His music can mean many different things to many different people. Just waiting around for 2/10/06! Does anyone know which Los Angeles theatre will feature the premeire? Reading this from London, UK! Can't wait 'til this film comes over here. I'm no one's Dad but I am a Mum, and have been a NY fan since 1971 when I was a mere lass!! Proud to say that my daughter, herself a grunge guitar-playing teenager, is also a Neil fan.